Family Owned & Operated Florist in Southampton, PA for over 40 years! 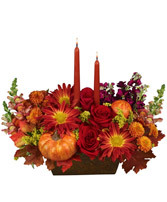 Surprise your loved ones with this Thanksgiving Feast of flowers from Cherry Lane Flower Shop. Share love and warm feelings this season with beautiful fall flowers. Call us today or order a Thanksgiving floral arrangement online 24/7. This colorful flower arrangement from Cherry Lane Flower Shop is a great choice for Halloween and Harvest decorating themes. Seasonal accents like miniature pumpkins give it a special touch of fall festivity! IN THE SUMMER:CLOSED SATURDAYS BUT ANY PRE-ORDERED ARRANGEMENTS PLACED OVER PHONE BY FRIDAYS 5:00PM CAN BE DELIVERED ON SATURDAYS.